Natural Aluminum Fry Pans Are Used Cookware For Frying, Searing, Sautéing And Other Foodservice Applications. 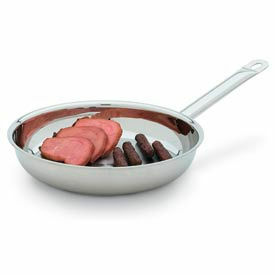 Natural Aluminum Fry Pans are made of heavy gauge aluminum for long lasting durability and dependability. Various recognized brands offer wide selection of type and size pans that feature ergonomic silicone, plated or forged handles for ease of use. Available in 7, 8, 10, 12 and 14 inch diameters and 1-3/8 to 2-3/4 inch depths. Removable Sleeves or Pan Grips that provide comfort and protection also available. Non-Stick Fry Pans Are Used For Frying, Searing, Sautéing And Other Foodservice Applications. Non-Stick Fry Pans are made of aluminum, carbon steel or iron for long lasting durability and dependability. Various recognized brands offer wide selection of type and size pans that include non-stick coating for quick food release and easy clean up. 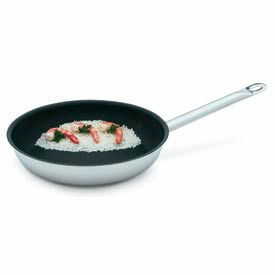 Fry pans feature ergonomic silicone, plated or forged handles for ease of use. Available in wide range of 4-3/4 to 14-1/4 inch diameters and 3/4 to 3-1/4 inch depths. 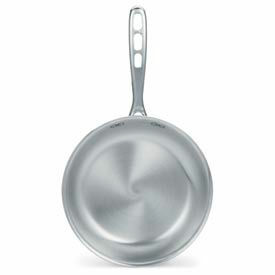 Stainless Steel Frying Pans Sear Meat, Sauté Vegetables, Stir Fry Dishes And More. 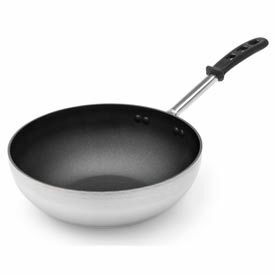 Stainless Steel Fry Pans are designed for long lasting durability and sturdiness to withstand repeated cooking and cleaning. Mirrored finish compliments cooked food. Rounded lip makes pouring easy and increase strength and structural integrity. 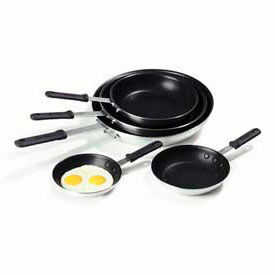 Some frying pans available with silicone handles to reduce burns and injuries. Diameters range from 4" to 17-3/4" to meet commercial cooking requirements. Additional dimensions and package quantities vary by model. Fry Pans Are Great For Frying, Scrambling, Sautéing And Searing. Professional fry pans are great for commercial environments, cooking schools and more. Non-stick coating allows quick release of food and easy cleanup. Comfortable hollow handles stay cool and may be hung from hooks for easy storage. Low walls help maintain temperatures. Fry pans are available in a variety of sizes. NSF® certified. French-Style Steel Fry Pans Are Versatile Cookware That Goes From Stovetop To Broiler Or Oven. 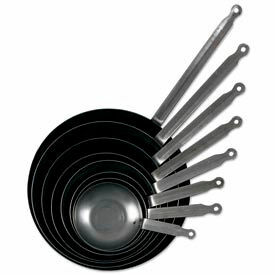 French-Style Fry Pans are made of durable steel for quick heating and thorough temperature retention. Welded handles offer long lasting durability and strength. Diameters range from 6-1/4 to 16 inches. Winco brand pans are sold in quantity of 6. Alegacy and De-Buyer pans are single units. Additional dimensions vary by model. Stir Fry Pans Are Great For Stir-Frying And Wok Applications. Cookware heats evenly without hot spots. The vented handle reduces heat transfer from pan to handle, maximizing operator comfort. Handles are rated at 450°F (232°C) for stovetop or oven use. Flat bottom sits level on surface. Aluminum core provides even heat on bottom of pan and side walls. 18 gauge stainless steel exterior is induction ready. Carlisle Pans & Pots Are Designed For A Variety Of Cooking Applications. Carlisle Pans & Pots are made of stainless steel for long lasting durability. Features a reinforced steel design for added strength and support. Handles or loops offer greater comfort and control for enhanced reliability. Available in a variety of styles for greater versatility. Dimensions vary per model. Package quantities are 1, 3, 6 or 12. 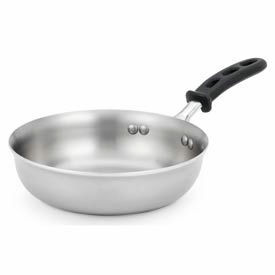 Alegacy F32 - French Style Steel Fry Pan, 12-1/2" Dia. Alegacy SSFPC14 - 18/8 Stainless Steel Fry Pan w/ Helper Handle PTFE Xtra 14"